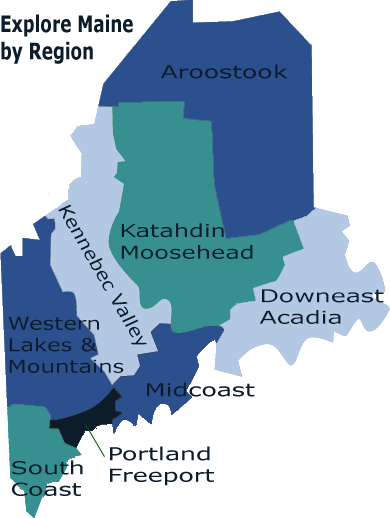 The DownEast & Acadia Region is extremely diverse with a beautiful and dramatic coastline as well as inland areas with rich forests, meandering rivers and sparkling lakes carved out by the receding glaciers at the end of the last Ice Age. The region boasts everything from the 1,530-foot Cadillac Mountain – the highest point on the eastern seaboard north of Rio de Janeiro – to the beauty of Passamaquoddy Bay, the first place the sun rises in the U.S. to the natural splendor of Grand Lake. We also have more lighthouses (24!) 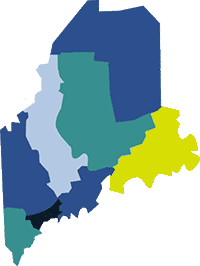 than any other region in Maine. Seafaring traditions and culture are still thriving in many of the coastal towns and villages. Whale watching, hiking, biking, kayaking, canoeing and fishing are all part of what make the DownEast & Acadia Region special and our history is preserved through our historic homes, museums and historical societies. As you enter the region from the west, you will cross over the brand new Penobscot Narrows Bridge. This engineering marvel also boasts an observatory, over 400 feet high, from which you can see the entire region. Accessible from Fort Knox, you will not want to miss the view from the top. After you cross the bridge, you will enter the town of Bucksport. Folklore buffs might want to stop at the historic cemetery in town to see the grave of Jonathan Buck, with the footprint of a witch on his stone. The Blue Hill Peninsula is an area rich in beauty and renowned for its artist community and its rich maritime history. The town of Castine, home to the Maine Maritime Academy, is one of Maine’s historic jewels. Nearby is a half-mile-long suspension bridge spanning Eggemoggin Reach to Deer Isle and Stonington, one of Maine’s liveliest lobster towns. You will also want to visit Blue Hill itself with its small town charm and lovely shops and galleries. Further to the west is Ellsworth. The shops and restaurants in Ellsworth’s quaint downtown are delightful for an afternoon stroll or to have a delicious dining experience. If you enjoy theater, you may want to check out the performances at the restored Grand Theater right on Main St.
No Maine destination is as well known or visited as Acadia National Park on Mt. Desert Island. The second-most visited national park in the United States, Acadia is an impressive 35,000 acres in area and includes 41 miles of spectacular coastline. Visitors to the park will want to experience the carriage trails, maybe including a stop for popovers and tea in the afternoon. The Park Loop Road is the link to many of the interesting sites located within the park, including Sand Beach and Thunder Hole, a tidal cavern that allows trapped water to create booming water spouts that shoot up to 40 feet in the air. Explore the entire island. Discover Bar Harbor, with its shops, museums, and restaurants, as well as quaint towns such as Northeast Harbor, Southwest Harbor and Tremont. You might also like to visit the Schoodic Point and Isle au Haut, two areas of the park not located on Mount Desert Island. Heading further downeast from Mount Desert Island, you will find the Schoodic Peninsula with its towns of Gouldsboro and Winter Harbor. To the east, explore Milbridge, Harrington and Columbia Falls, quaint villages with rich histories. Or visit Cherryfield’s National Register Historic District with its 52 architecturally significant buildings from the 1800s. Nature is also allowed to take center stage here as the land bears native wild blueberries (80 percent of the nation’s wild blueberry crops are raised here) and virgin timber, and the earth sustains an amazing range of wildlife, from moose and deer to eagles and puffins. Numerous quiet trails and treelined lanes often lead to unmatched ocean views, and coastal communities such as Jonesport and Jonesboro offer visitors the opportunity to visit typical fishing piers, nature preserves and even a shellfish hatchery or two. If you love lobster, Jonesport and Beal’s Island are not to be missed. Situated between the ocean and wide, flat wild blueberry barrens to the north, Machias is the centerpiece of Washington County’s tens of thousands of acres of wild lands and celebrates the blueberry harvest each year in August. Incorporated in 1763, the village’s history goes back centuries. It was here, near Fort O’Brien, that the first naval battle of the Revolutionary War took place even before the Battle of Bunker Hill in 1775. Machias is also the commercial hub of Washington County and the wreath making center of Maine. The first place in America to see the sunrise is the Way DownEast Region. The area is ideal for bird watching and moose spotting and you won’t want to miss a visit to Quoddy Head Sate Park and the candy-striped lighthouse on the easternmost point of the U.S. Or cross the bridge into Canada (don’t forget your passport or passport card!) and spend the day visiting FDR’s summer home and grounds on Campobello Island. Continuing along Route One, another interesting attraction is a granite monument on the road between the coastal communities of Lubec and Eastport. Placed at the site of the Reversing Falls Park by the National Geographic Society, the monument marks the 45th parallel, the exact midpoint between the equator and the North Pole. Take your picture standing in the middle of the Northern Hemisphere! Eastport is a thriving community with shops, historic sites and wonderful restaurants. It’s also a great place to take a whale watching cruise and see whales, porpoises, eagles and nature at its most pristine. Calais, the largest community in the region, was settled in 1770 and is home to the St. Croix Island International Historic Site. There, in 1604, Sieur de Mons and Samuel Champlain settled with about 80 others, making it the first permanent French settlement in the New World. Make sure to stop en route to visit the St. Croix Island International Historic Site overlooking the site of that settlement. If you enjoy hunting and fishing you won’t want to miss a visit to Grand Lake Stream. It is world famous for excellent fly fishing and there are Registered Maine Guides who can take you to the best spots. The Natural History Museum at the College of the Atlantic in Bar Harbor features dioramas depicting the plant and animal life of coastal Maine. The Wendell Gilley Museum of Bird Carving in Southwest Harbor offers everything from miniature waterfowl to life size owls, from carving demonstrations to wildlife art exhibits. The Mt. Desert Oceanarium is located in two locations and children and adults may enjoy the close-up views of Maine’s watery “denizens” and get to know them up close in the “Touch Tank” and at the lobster hatchery. Columbia Falls is home to the Ruggles House, an 1818 showplace, built by Judge Thomas Ruggles. The Burnham Tavern Museum in Machias was built in 1770 and is the oldest building in eastern Maine and the only one with a Revolutionary War history. It was the meeting place for the men who gathered to fight the first naval battle of the war. Moose-horn National Wildlife Refuge features more than 22,000 acres of hills, streams, lakes, bogs and marshes. It is open to hiking and nature watching of more than 200 species of birds and plenty of moose. Lubec – the easternmost town in the United States – features West Quoddy State Park. The 485-acre site located right on Maine’s bold coast offers hiking trails and picnic areas with views of Canada, Grand Manan Island, whales and sea birds. Here you will find the highly photographed, red-striped West Quoddy Head Light. The Waponahki Museum and Resource Center in Perry features old photos of Passamaquoddy Indians, old basketry and crafts, as well as mannequins formed by individuals of the tribe. Roque Bluffs State Park is a great picnic area featuring a fresh water pond and 900 yards of sandy beach. There is also a great playground, restrooms and pedestal grills. 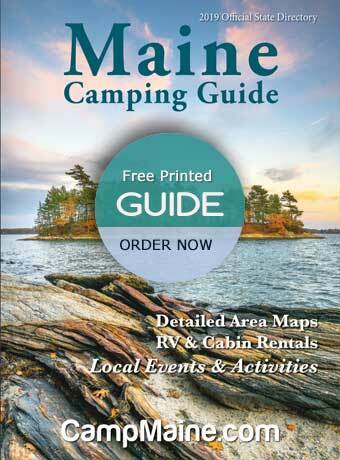 For additional regional information visit Downeast & Acadia and VisitMaine.